Clive Bundy is a rancher in Clark County Nevada (southernmost tip of the state) who has been fighting the federal government since approximately 1993 over the grazing rights of his cattle. The Feds (BLM - Bureau of Land Management) filed an injunction against him in 1998 (during the Clinton presidency) and now in 2014 (during the Obama presidency) they are forcibly removing his cattle with the use of helicopters as "herding devices" (my words). Some of the cows are being separated from their calves which will most likely result in the starvation of their calves. Also, the BLM has a backhoe and a dump truck on site to remove/dispose of any of the cows that have needed to be euthanized...for whatever reason. All this to protect some stupid "desert tortoise" that has survived all these years but will now somehow become extinct if these cows aren't killed...er, "removed." Aren't you loving your federal government about now? Don't forget to pay your taxes in 5 days. Over the past few days I've read several news stories about this situation. I could provide you with 30 links about this story (none of which you'd be likely to click on - I did include several videos below). Instead, I'm going to give you the screen shot below which is from an interview that Clive Bundy did with Sean Hannity on FOX News last night. 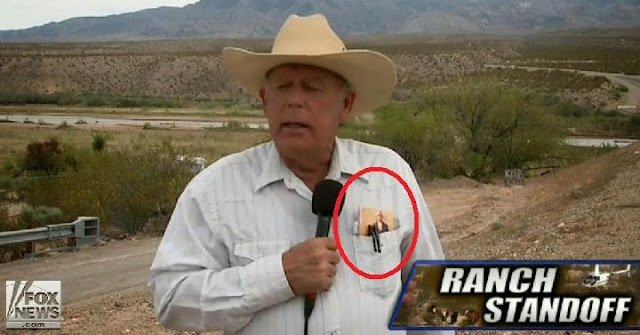 Clive Bundy has a pocket Constitution in his pocket. I don't think this man is going to be giving in anytime soon. Those of you I saw in this video who were also recording this: Stay calm, everyone. Hold your cellphones horizontal (for a wide-angle shot - not "up & down" or vertical). The less you move your camera the better the video will be. If you move too much, not much will be worth viewing (or be useful) in your video. If you talk too much while you're recording, later you will probably wish you hadn't. (I learned all this from recording plenty of my own useless videos.) Necessary information is great...editorializing while you're "fired up" is not so great. This is a great video. Great job. I wish I could stand there with all of you. I hope more citizens show up over the coming days. God knows more Feds will show up. Will the Feds make this another Ruby Ridge? Stay safe everyone. Keep your heads so that the people around you also remain safe. "Dave Bundy, son of Clive Bundy out of Jail after arrest for defending Cattle. No Charges!" The bruises on the left side of his face are from the BLM agent's boot smashing his face into the ground while they were arresting him. The audio in the beginning of this video is horrible, but you can get some info from it. At about 7-minutes into the video they hand him a microphone and the audio improves greatly. At 20:40 in this video there is a brief interview with Clive Bundy.